Create Jobs. The Campaign’s $1 billion investment will create 10,000 jobs over 10 years, and support job training and local, inclusive hiring. Strengthen Communities. The Campaign seeks to preserve existing affordable housing, reduce household expenses for low and moderate-income residents, help small businesses keep their doors open, and support the City and School District to reduce costs, address deferred maintenance and invest in buildings across our city. Cut Energy Bills. 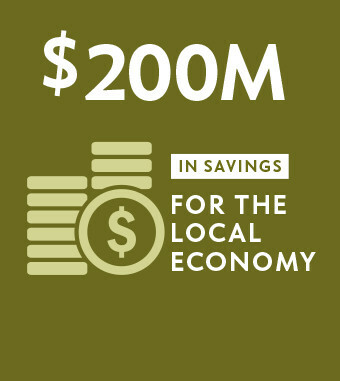 The Campaign will drive energy efficiency projects that will reduce building energy use by over 20%, collectively saving over $200 million citywide. Reduce Pollution and Support Public Health. The Campaign will reduce carbon emissions and other environmental pollutants, improve public health through better indoor and outdoor conditions, and support our City’s efforts to mitigate and adapt to climate change. The Philadelphia Energy Campaign was developed by the Philadelphia Energy Authority through the leadership of City Council President Darrell Clarke, investing in clean energy and energy efficiency to drive job creation in Philadelphia. The Campaign provides a variety of other public benefits, from job training to social equity, housing preservation to carbon reduction, improved public health and neighborhood stabilization. 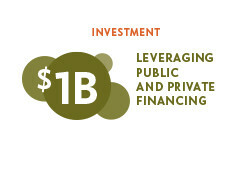 The Campaign is a bold, neighborhood-driven plan to invest $1 billion in energy efficiency and clean energy over the next 10 years, leveraging both public and private dollars. We are creating scalable pilots to develop program models that work, bringing on key partners, and then will implement initiatives in each sector at scale to create real, lasting impact for Philadelphia and its citizens. Our implementation process has 3 steps: Plan, Pilot and Scale. 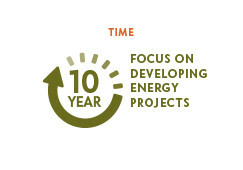 PEA began implementation of the Campaign with an initial 6-month planning period. We are now in pilot phase for multiple programs, and will work on modeling and testing those programs over the course of the next year. Once we have established effective models, we will focus on scaling up the programs to achieve our longer-term goals. Since the Campaign was announced, PEA staff has conducted meetings with over 200 stakeholders, experts and advocates. We developed key partnerships for initial pilots including utilities, lenders (including many that are new to Philadelphia), energy services companies, property owners, city programs, businesses and non-profits. We have already created and supported pilot programs that, once fully developed and implemented at scale, will create more than 5,100 of the Campaign’s jobs. 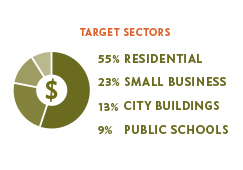 The Energy Campaign is focused on four key sectors: Municipal Buildings, K-12 Public Schools, Low and Moderate Income Residential Housing, and Small Business.